I was in the middle of getting ready and could hear it going down. I heard the freezer door, then the pitter patter of feet running across the house. So, I grabbed the camera. 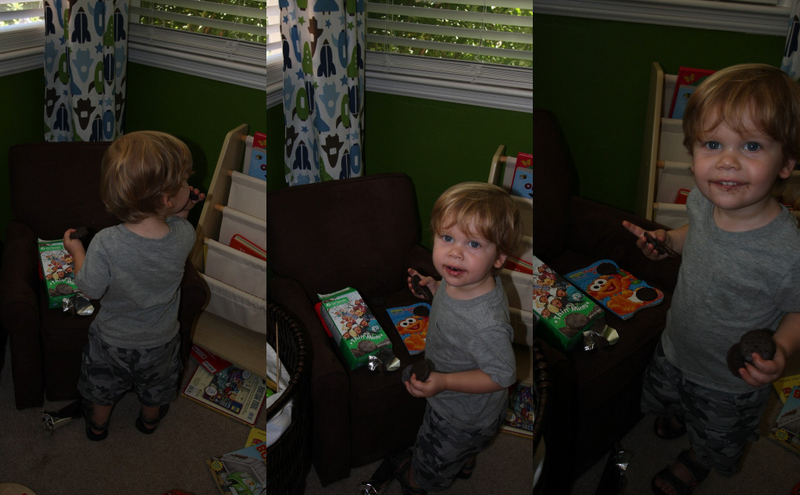 What I didn't expect is that Connor apparently now knows how to rip open the foil packaging that the cookies are in. You can't tell in the pictures, but his mouth is totally full and he has like 4 cookies in his hands and cookies spread all over his room. I took most the cookies away, but it was so adorable, so I did let him keep a couple. And in case you are wondering, I have learned my lesson and am locking the fridge more often. And Connor? He screams and cries every time he sees me lock it. Kind of makes me laugh. He's so cute, cookie face and all! I can't believe you have to lock your fridge!! And it's cute that you let him keep a couple. WOW! As a non-parent, I would have never thought that locking the fridge was necessary. But, clearly it is! This would be one of those situations that I would be laughing WAY to hard to discipline effectively. I love that you caught photographic evidence to show him in the future!